Like many plants and herbs, the hydrangea is more than just a beautiful flowering plant. The roots and rhizomes of this shrub contain numerous phytochemicals and nutrients such as calcium, selenium, zinc, and magnesium that are used for medicinal purposes. The most common use for hydrangea root is to assist the kidneys and bladder due to its effective diuretic property which helps increase the flow of urine. This removes impurities from the system and lessens the likelihood of infection along the entire urinary tract, which includes the kidneys, bladder, prostate (in men) and urethra. Hydrangea, like chanca piedra, is also considered an antilithic herb, which prevents stones or gravel from forming in the kidneys and bladder. As an antilithic herb, it can also assist the body in removing stones and gravel from these organs once they’ve formed. This was a primary use of hydrangea by Native Americans -- a sort of kidney detox. The findings of Japanese researchers amplify observations of nineteenth-century American physicians who used hydrangea primarily as a treatment for "kidney gravel," small stones in the kidneys that could be passed with a minimum of pain after treatment with the herb. 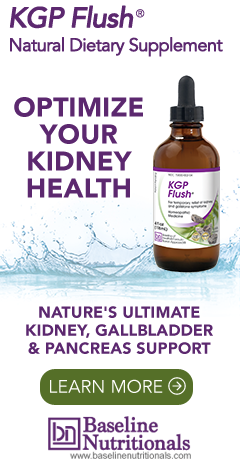 For these reasons, you’ll find it as an ingredient in Jon Barron’s KGP Flush formula, designed to naturally optimize the kidney, gallbladder, and pancreas. Like most diuretic herbs, hydrangea root or root tea is an excellent choice for treating an inflamed or enlarged prostate and is commonly combined with horsetail for this purpose. Maintaining healthy urine flow keeps the prostate less likely to constrict around the urethra, which prevents stagnant urine from causing more infection. This can also reduce inflammation by eliminating impurities from the prostate. A scientific study published in Bioscience, Biotechnology, and Biochemistry in 2003 noted that hydrangea root extracts have greater antioxidant power in liver tissue than milk thistle and turmeric combined. And nineteenth-century physicians used hydrangea as a treatment for chronic chest pain caused by bronchitis. More recently, hydrangea has been studied to determine its benefit with autoimmune disorders such as rheumatoid arthritis, multiple sclerosis, inflammatory bowel disease, type 1 diabetes, eczema, and psoriasis. These disorders occur when harmful variants of T-helper 17 T-cells are created by the body. A study published in the June 2009 issue of the journal Science showed that halofuginone (a molecule extracted from the hydrangea) reduced disease symptoms in mice bred with autoimmune disorders. This study showed that halofuginone may be able to selectively stop production of the harmful Th17 T-cells without harming beneficial T-cells. Hydrangea root is usually found in herbal combinations and tinctures, especially those addressing cleansing or elimination. The bark is used externally to help relieve wounds, burns, sore muscles and sprains. However, it should be noted that the leaves of this plant contain toxic substances and should never be consumed. Next time you see the big, expansive flowers of the hydrangea, let it serve as a quiet reminder of the help mother nature has given us to treat and prevent some of our more common ailments! This was truly informative. Your site is useful. Thanks for sharing! Treat kidney failure,restore kidney function. Protect ur kidney with ayurvedic medicines.No need to go for dialysis to the patients who have not yet started the dialysis&the ones who have started their dialysis recently,is possible to stop the dialysis in coming months.keep away the thought of kidney transplantation from ur mind. Good advice, Rajesh. Many continue to assume western medicine can cure their illnesses stemming from poor diets. The fear induced when they receive their dire diagnoses impels them to take what they think is their only way to survive by submitting to invasive surgeries, toxic prescriptions and burnings with radiation. It's particularly sad to me as my mother was taken out that way. Since then, I've been an alternative health professional (24 years) and have found so many truly "natural" elements that I've personally experienced complete healings i.e., degenerative illnesses and pathogenic infections. There are no truer words than those spoken by the Father of Medicine, Hippocrates "Let food be thy medicine and medicine be thy food." Is there any benefit of tincture VS capsule? Also, how often should one use Hydrangea? How long can one safely use this root? You may find this page helpful: KGP Flush formula. Also, https://www.baselinenutritionals.com/why-baseline. Note that alcohol preserves an herb much longer than what a capsule can do, but there is so much more to this. Is it organic? When was it harvested? How did they extract it? Do they test for heavy metals?